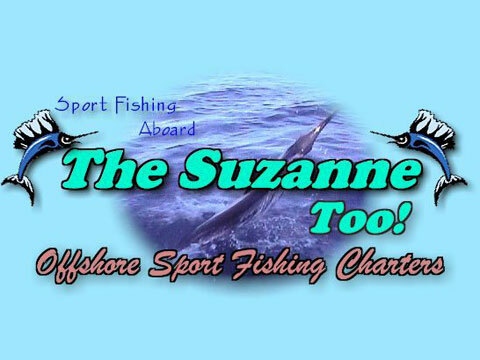 The Suzanne Too is a 31' Gulfstream tournament rigged offshore fishing boat built in South Florida. Enjoy the Fishing adventure of your life. From Novice to Expert, our professional crew will cater to every angler's needs Full and Half-Day trips are available. Your trip includes everything for your fishing pleasure from ice to bait to fishing gear. All you need to bring is what you need to eat and drink. Offshore and Reef Fishing at it's best with a happy, hard-working and knowledgeable crew! Enjoy Florida Keys Fishing aboard the "Suzanne Too". A thirty-one foot custom built sports fishing boat with 12' beam, newly re-powered with Cummins diesel engines and the latest fishing electronics - a fast and comfortable boat ready to get you to the fish fast, and give you more fishing time. Wahoo, Dolphin, Tuna, Mutton Snapper, Grouper or sailfish are just a few of the fish waiting to be part of your catch. Captain John has over 40 years of fishing experience. He fished for many years out of Barnegat Light and has won recognition both in the northeast, and the Florida Keys. We area family owned fishing business and we know the value of happy, fun memories with family and friends along with relationships, camaraderie, team spirit and loyal staff. Our happy, hard-working and knowledgeable crew is ready to get you on the water where the fish are! Our charters are economical, and include everything for you fishing adventure. From novice to expert, our crew caters to every angler's needs paying special attention to children and new anglers. We clean and filet your catch and can even arrange for mounts.